Present state: Platform buildings and platforms have been demolished but the line through the station is used by, amongst others, Virgin Trains and Arriva Northern services. The main station building at street level has been converted into an Indian restaurant called 'The Orient Express'. footbridge and wooden waiting rooms on the other platforms. It closed in 1988, except for a few football specials. which avoided a direct routing through the region's main settlement of Sheffield altogether, due to difficult terrain on the prospective route south of Sheffield, by routing down the Rother Valley. 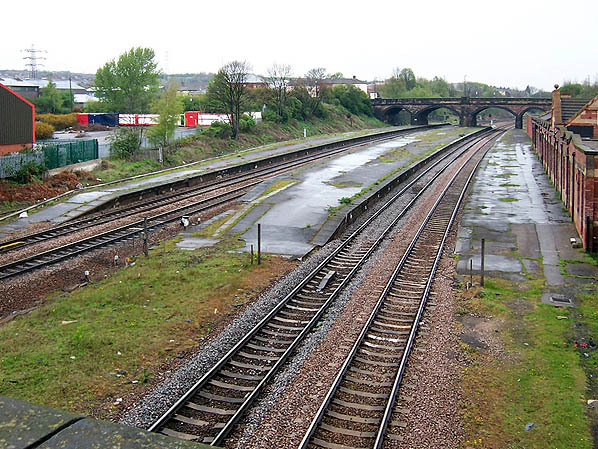 At Rotherham the line passed over the Sheffield & Rotherham Railway's Sheffield Wicker to Rotherham Westgate line and a large triangle junction was built allowing trains from the north and North Midland trains to travel into Sheffield from the northeast along the Don Valley. Immediately to the north of this junction stood Rotherham Masborough station. 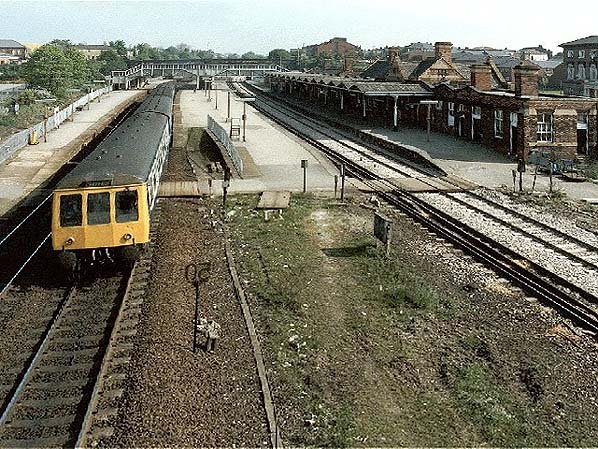 As built, the station had two short staggered platforms with the main station buildings on the up side; the down platform was an island. A goods shed and sidings stood at the north end of the up platform. By the early 20th century both platforms had been extended and were now facing and spanned by a footbridge. The goods shed had been demolished and replaced with a single livestock siding and pens replacing earlier livestock pens a short distance to the north. 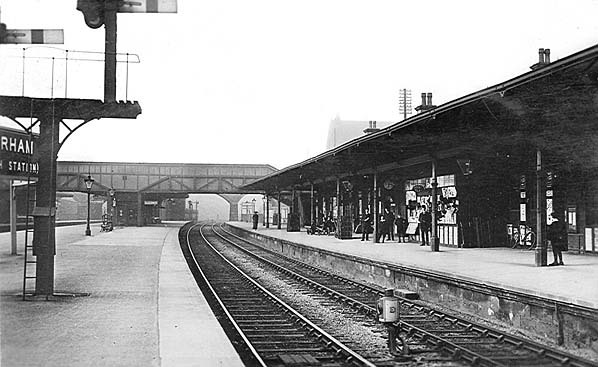 By the 1920s the station had been further expanded with another side platform on the down side. The name was changed to Masborough & Rotherham on 1 May 1896 and again to Rotherham (Masborough) on 1 April 1908. 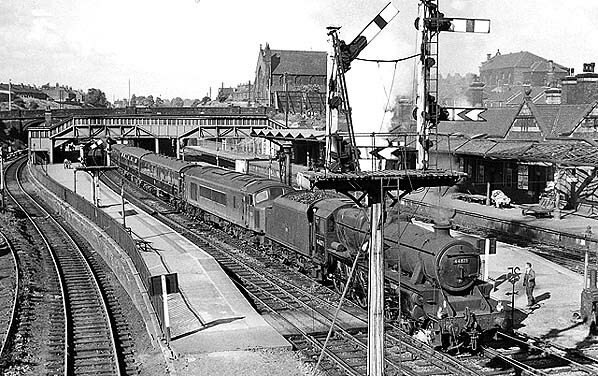 In the late 1850's, Sheffield was finally linked with Chesterfield, allowing Midland Main Line trains to call at the newly-opened Sheffield Midland station on their way north, passing back on to North Midland metals via the Sheffield & Rotherham.. As late as the 1940's some long distance passenger trains still used to original Chesterfield - Rotherham 'old road', avoiding Sheffield and calling at Rotherham. Other ex-London expresses would slip a coach at Rotherham until this practice was discontinued nationally from the 1930's onwards. The corresponding up working would involve the coaches being worked to Sheffield Midland by a local train and the attached to a London express there. Up until the 1980's the odd London-Leeds express train would call at Masborough. During the 1960's rationalisation of railways, Rotherham Masborough became Rotherham's only station and eventually lost its 'Masborough' suffix. 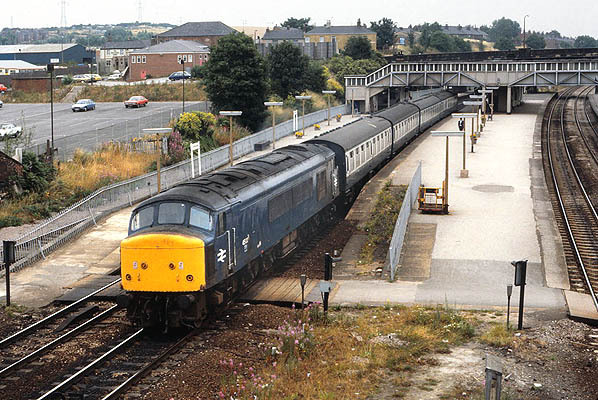 Shortsighted track and signaling rationalisation in the early 1980's meant that platforms 1 and 2 could not be used by Sheffield-bound trains without reversing which made them effectively useless and removed much operational flexibility on the line as express trains could no longer pass local trains at Rotherham without reversing. station, at the same time recreating the flexibility to pass expresses that had been removed a few years earlier. 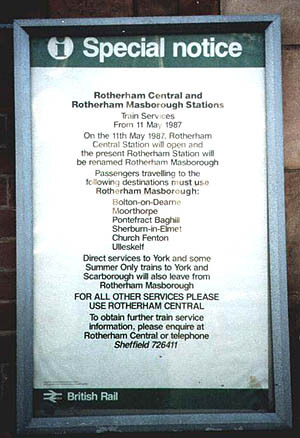 Rotherham Masborough regained its suffix in the timetables (although the station signboards were not modified) and soldiered on for a few years with Sheffield-York trains stopping until eventual closure in 1988. 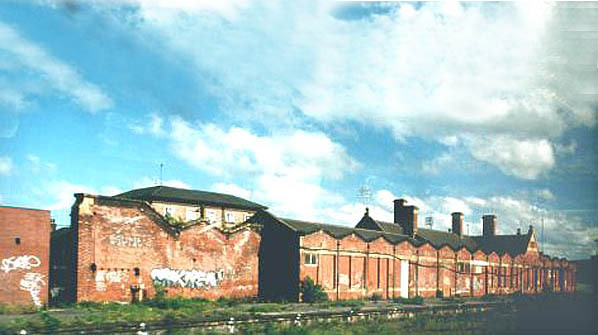 Most of the station buildings were demolished in the early 1990's but the platforms still remain, and the line through the station is still used by express and freight services. In later years both Masbrough and Masborough are used. The last Bradshaw shows the spelling as Masborough while the current Ordnance survey map shows Masbrough. Rotherham Masborough station looking south. 1889 1:500 OS Town Plan showing the original layout of the station with two short staggered platforms and a goods shed at the north end of the up platform. The original name of Masbrough is shown. replaced by a livestock siding and pens. The name is now shown as Masbrough and Rotherham. 1934 1:2,500 OS map. This shows the station after further enlargement, a second side platform has been built on the down side. 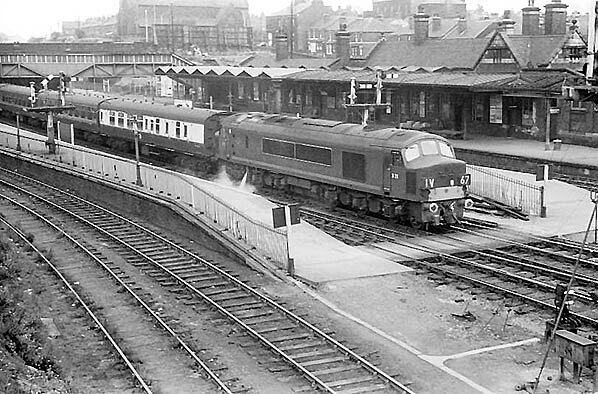 Rotherham Masborough station in the mid 1960's, on this occasion the diesel is in fine fettle. Rotherham Maslborough station looking north in October 1984. 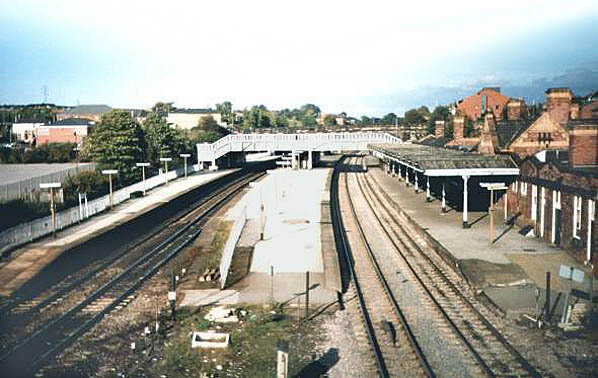 Rotherham Masborough station looking north from Coronation bridge on 3 October 1988, the last day of passenger service. 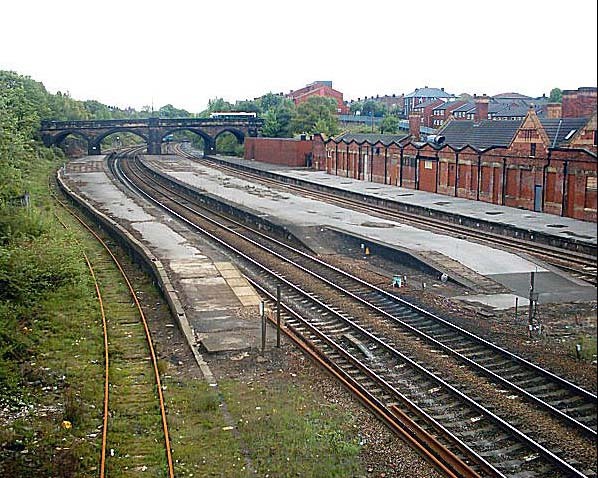 Rotherham Masborouigh station looking north in 2004, 16 years after closure. Rotherham Masborough station looking north from Coronation bridge in 2008.